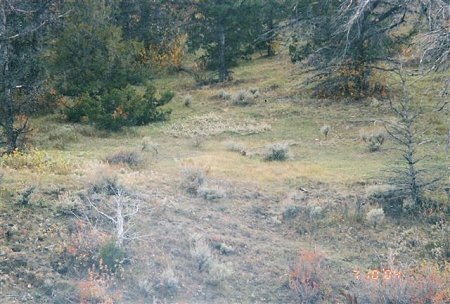 These picture are courtesy of Rori Renner, Bighorn Basin Chapter Sportsmen for Fish & Wildlife Board Member from Meeteetse, Wyoming, and were taken October 29, 2004 on private land near Meeteetse, Wyoming. The Renner's have a working cattle ranch on the Wood River, approximately 35 miles southwest of Meeteetse. This is what landowners on working ranches in northwest Wyoming face when they go out to check their herds on a daily basis. Wildlife Services Personal confirmed the cattle kills as wolf depredations.